We have been getting some wonderful days and just the right amount of rain. Although I think we have had enough rain for a while. It seems to come down in inches now. I even took some time to sit in the sun and knit one day. The Chestnuts from my Son’s trees are falling and getting them collected before the Chippy’s and squirrels get them is a feat for his family. At this time of year many restaurants in the Boston area love to have them. Today the weather has turned sharply cooler with winds but beautiful sun.. We may have a frost tonight and more torrential rains on Sunday. My friend Jane asked me if I would like to ride along with her to Adams , she needed to go to social security. It’s a beautiful ride along route 2 ending with The hairpin Turn. It’s a ride that I have taken since I was a young child. The store where my Grandfather bought my little drum is still there! The leaves are slow to change this year so it was mostly yellows and browns with the occasional red thrown in . We had a leisurely lunch and she took me on a tour of the town. Jane was a Vicar there for a few years. It’s a town of Church spires and much beauty. The social security visit was quick and we took another route home 8A which was even more beautiful than the ride over. A wonderful day with a good friend. We are so lucky to live in such a beautiful and diversified state. A new venture was started by some local weavers and I attended one venue of it. It was well attended. 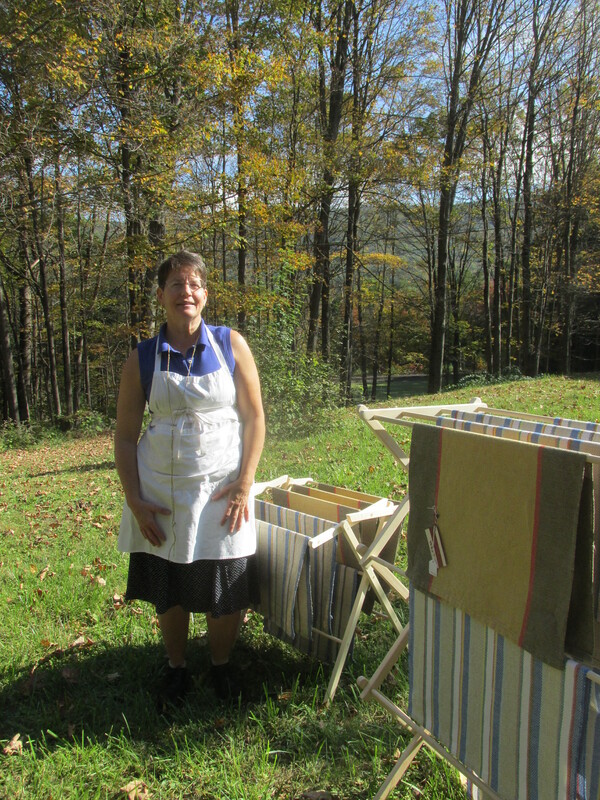 My Friend Lisa had her handwoven and some handwoven and hand spun towels and on her spinning wheel was some flax that she was spinning. Another friend Emily, had towels, napkins and a whole array of handwoven things. She was giving tours and answering all kinds of weaving questions. Both weave on Swedish looms. I have dehydrated all the catnip and hope to do some other herbs but right now there are hot,red peppers being done on the porch. Then will come the orange slices which will go into potpourri . The house always smells good at this time of year. Last week my grandson Charlie and I cleaned the barn. He also put up the extension cord for Maude’s hot water bucket. We need to cover the window with plastic and clean up around the entrance to the barn and the sheep will be ready for winter. I hope to get the downstairs front chickens sorted out tomorrow I would like to separate the bantams from the regular hens. They get picked on . I have figured out how it will be done and need to get working on it. The trip to Ireland is coming fast and these things need to be done. It is one of my favorite days of the year. 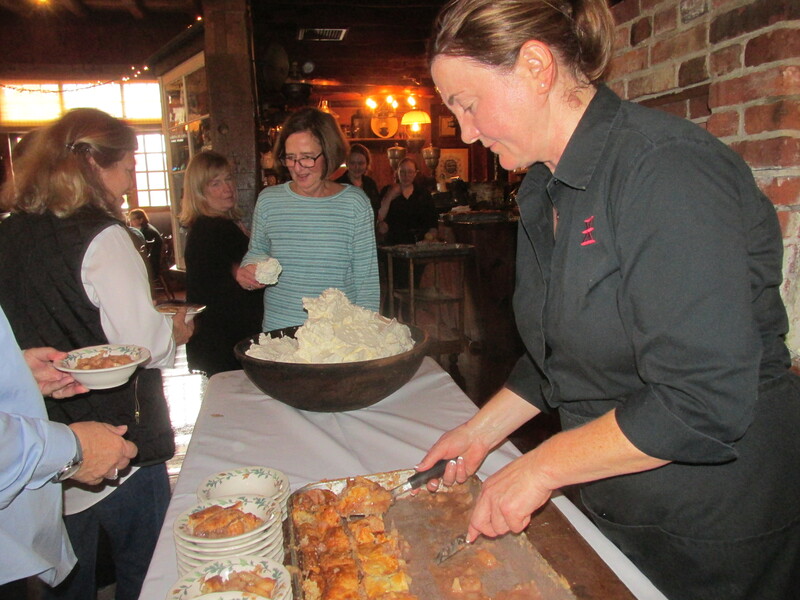 Deb and I have been doing the Woolen Memories Hook Inn for 17 years. Starting in Hardwick, Ma and now at The Salem Cross Inn. This year we had a lovely group of gals 7 in total. It was a wonderful day. It was close to 70 out, usually we have snow flurries! The vendors were great carrying things from wool to needle punching things, cookies to antiques. Looking forward to next year. Every once in a while I get a surprise package in the mail from my Cousin Gary. It could be a box of black walnuts or some sheepy item he found. I don’t know where he ever finds these unique sheepy things but I do love them. 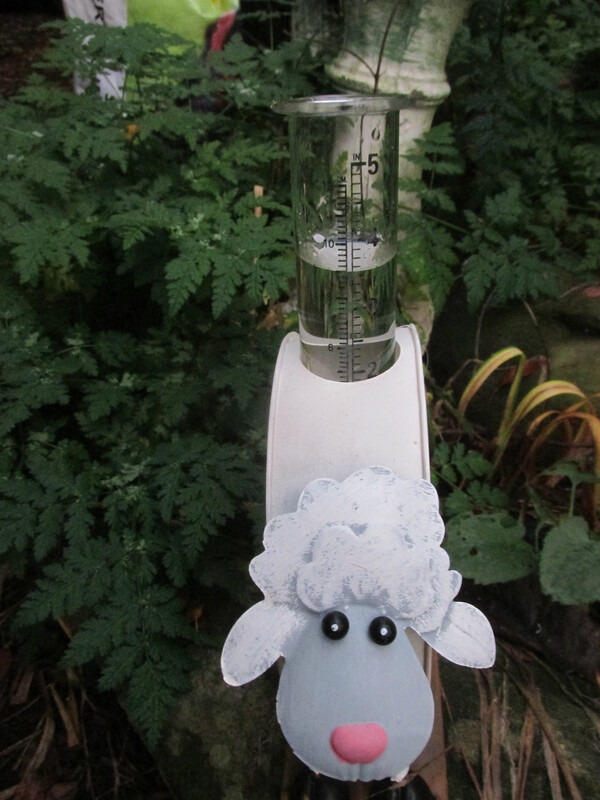 This rain gauge is so cute and the last torrential rains we had there was over 3 inches in the gauge. I have always wanted a rain gauge. Of course he will be coming in soon and go back out in the spring. Thanks Gary for brightening up my day. and haying machinery has been stored for the winter. Rains from the most recent hurricane have poured down upon us today, we do need the rain. I haven’t spun at this fair for 4 or more years. It has changed so much with more vendors, fresh Hatfield veggies for sale, who can resist Hatfield potatoes or onions. Library book sale and so much more. I was with the Springfield Weavers who let children weave on Structo Looms and gave them a card with a hand woven piece of cloth in it for their efforts. We were in the tobacco barn with all the wonderful old things. The day went by quickly with lots of questions from children and adults about spinning and sheep. Looking forward to next years show. I have read this book some time ago and am revisiting it for my next trip to Ireland. The reviews say it’s a unique travelogue for the mobile but not agile. I remember when reading it before that it contained some really unique out of the way places which we hope to explore on this trip. A good read for anyone thinking of traveling to Claire, Kerry and West Cork. Brenda and Cookie who bought The Brick Meeting House had Oktoberfest on Saturday. It was quite successful 3 vendors, face painting and games for the kids, good Homemade food. Lots of people stopped by on their way to vacation destinations and many towns folk came to support the project. They still haven’t decided what will be in The meeting House but are open to suggestions. They will be having many more of these events and maybe a farmers market next year. A great addition to our town. Yesterday was their open house. I was there spinning with Marti Ferguson and Sandy Cardinal was weaving on an old barn loom. The setting was lovely, there were a team of Oxen and some ponies there. The house was open for viewing. It is a beautiful historic house. Hope you will put this on your list for next year. I couldn’t resist taking this picture. The view to the hills with rain clouds and crisp white curtains, made me think how many people looked out this window in the past, checking out their fields and animals, worried about wars, and freedom, not so unlike today. I would have thought things would have changed in these over two hundred years but alas I think they have gotten worse. Bigotry, racism, white supremacist, and other hate groups abound. People are all upset about kneeling in front of the flag. The flag is a symbol of our freedom and that is it. It is cloth. People show their patriotism in many ways and when people don’t have the freedoms that the rest of us have they should let it be known. That is what this country is all about. We all should have the same freedoms and rights not just a limited few. It really bothers me that people are all over the kneeling but won’t do anything about some laws to prevent mass killings. We have let the wrong people have too much influences over our elected officials. What is the matter with people? Somehow they missed history in school at least in the schools that I attended we had many lessons of what it means to be a patriot. My rant not for the day but ever since these evil people have come out of the woodwork. FROSTY MORNINGS-OCTOBERFEST-GARDEN DELIGHTS-DRYING HOT PEPPERS AND HERBS. The hot and humidity has cleared out and now we are hit with almost frosty temps. That is New England for you. We finally got some longed for rain. And now a stretch of wonderful weather. The Brick Meeting House is active again.. Come join us for lots of local crafts, food and a good time in Colrain. Next Saturday or rain date is Columbus Day, Monday for a wonderful fair. Sadly none of my pumpkins came up this year but to my surprise one rogue cucumber did come up and is giving me some nice cukes at the end of the season. The leeks did wonderful and I did remember to hill them up occasionally this summer. Half are in the freezer and I will pull up the rest soon. CAUTION PEPPERS CAN CAUSE BURNS WEAR GLOVES AND DON’T TOUCH YOUR EYES OR FACE. EYE PROTECTION IS RECOMMENDED. Small amount of Beeswax It all depends on how many peppers and oil that you use. Dry peppers (either in a dehydrator or by hanging them up) Place in a jar and cover the with olive oil then add two inches, making sure that no peppers can reach the top of the olive oil. Let sit for at least a month. Mine will sit for 2 or three months. This lets the peppers infuse with the olive oil. Strain the peppers through a cheesecloth and place in a saucepan. Put aside . Melt beeswax over a double boiler and put aside. Warm up the oil till its warmed through and then add the beeswax a little at a time. Testing drops on a plate as you do this. When you find that the drops solidify your are done. Do not overdo the beeswax. Pour into jars. This salve has worked wonders for me. When you put it on there is no hot sensation. It works slowly. It has also saved me a lot of money. Fr a small amount of money you can make 10 or 20 jars , and compared to what it cost in the store you could save hundreds of dollars. I started preserving Sweet Annie, which is one of my favorite plants .I finally found the perfect spot for it and they took off.. This year I bought 2 plants from Susan Bates at the Massachusetts Sheep and Woolcraft Fair. She has a brick and mortar store in Ashby, Massachusetts called Susan Bates Home and Garden. Her plants are of the best quality. She has lots of wonderful things at her shop, furniture, and antiques handmade things and she also occasionally has classes. Check her out on Facebook. 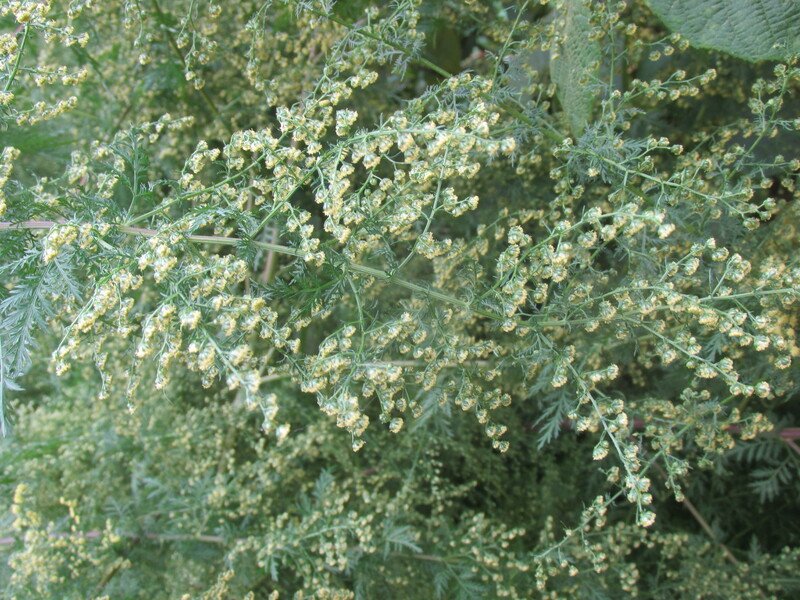 This year I have enough to sell a few bunches and am preserving them in a glycerin based mix. 1 put 1 part glycerin and 2 parts water. With freshly cut branches place them in the water mix for approximately one week. They will stay as they were preserved and not turn brown The smell remains and they are a perfect fall decoration and they repel insects. Many thanks for reading my blog on this lovely fall day. Carole.